Double Down for Diabetes Trivia Night to be benefit the Diabetes Education Fund at CoxHealth Foundation. This fund helps provide education, supplies and special needs of diabetes patients to help them manage their disease and achieve good health. You can impact Diabetes care in the Ozarks with your support. Funding from the Trivia fundraiser helps to provide free education courses for patients who are newly diagnosed. Education is key in helping a patient learn how to make life changes to support the improvement of their health and management of their disease. Funding also helps to provide needed diabetes supplies, medications and other special medical needs to get the patient back on the road to wellness. Diabetes makes up more than 35% of the patient base at CoxHealth today. Help us create solutions to this disease by sponsoring at one of the levels below. The Presenting Sponsors will help us Double Down on Diabetes and in return will have their logo on all flyers, advertising, social media and promotion done community wide and within the 11,000 employee base of CoxHealth as well as signage and recognition the night of the event. You will receive 3 tables at the event, a bottle of wine per table and a chance to speak during the program. The Presenting Sponsor will also receive a three month Community Partners promotion within CoxHealth to advertise your business to CoxHealth employees. You can also submit four trivia questions about your company so our attendees can learn more about your support! The Trivia Test Sponsors will help us Double Down on Diabetes and in return will have their logo shown during the evening as a part of the Trivia Challenge Slideshow Presentation. You will receive 2 tables at the event as well as signage and recognition at the event. You can also submit two trivia questions about your company/product/service as a part of the Trivia challenge! Help our participants learn more about your support! 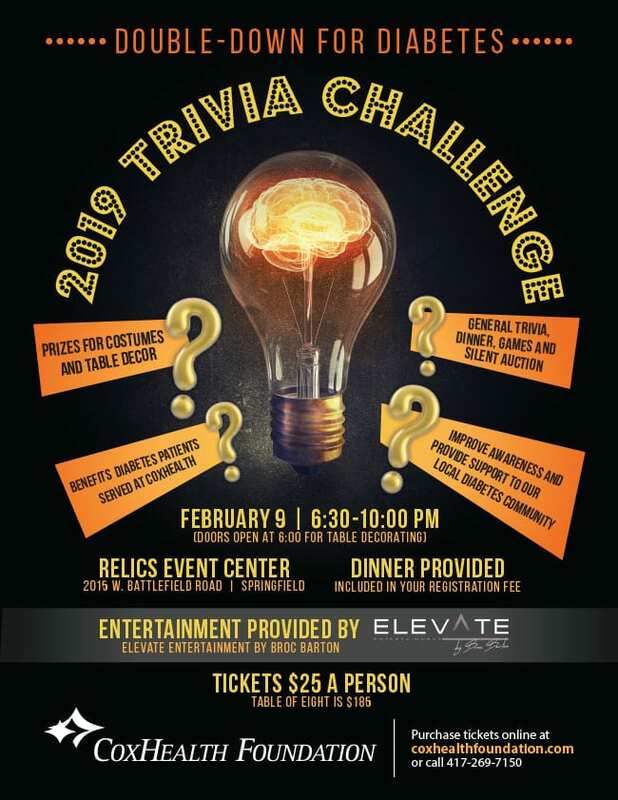 The Game Sponsors will be recognized during each round of the Trivia Challenge Event. You will receive one table and signage, recognition at the event. You can also submit one trivia question during the challenge to help participants learn about your support!